Forty life-sized wax Amish figures, once residents of the Lancaster County Wax Museum, have been put up for sale, as reported at philly.com. Dana DiCicco, who’s selling them, said they didn’t seem “creepy at all” when she was a kid in Pennsylvania Dutch country. Now, she can’t deny it. Even the dog feels off. DiCicco is putting them up for sale on behalf of her uncle, a longtime manager of the Amish Farm and House, a tourist attraction in Lancaster. The adult figures are going for $350 apiece, the children and dog for $250, and DiCicco said they’d like to sell them as a set. And some of the female and child figures. Even creepier? 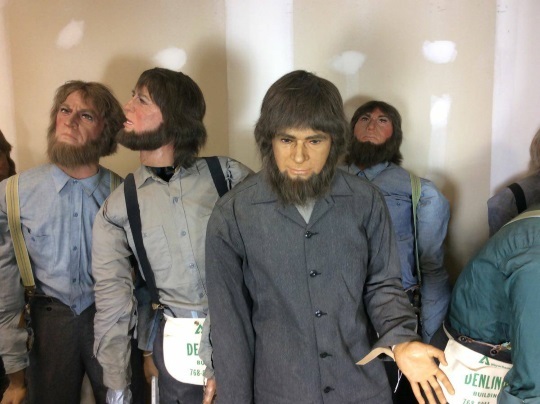 The wax figures, each standing 5 feet, 5 inches, once were part of the Lancaster County Wax Museum, which was opened in 1969 by Dutch Wonderland founder Earl Clark adjacent to the amusement park along Route 30. The museum featured dioramas of local history, including the burning of a Susquehanna River bridge to thwart the Confederate Army and also one about pretzel-making. William Penn was there. Ben Franklin, too. The centerpiece of the museum was the Amish barn-raising scene. Adding to the creepiness, some of the figures are mechanical and can move, and at least one can, or at one time could, “speak”. The article came out about 2 weeks ago, when I was traveling, so I missed posting about it at the time. No word if they have been sold in the meantime, though the Craigslist listing has been deleted. I’m not sure I’d want these hanging around my home, but maybe a collector can put these wax Plain People to a new use. I think the wax figures should remain in storage. Some of the figures’ facial expressions are unpleasant and some of the clothing does not seem to be traditional Amish-style. It would have been interesting to see the setting in the museum where these figures were displayed. Might be interesting to keep the whole family together sitting around a table. You then have the a family still eating together. You would have quiet peaceful meals. Reading from the bible after each meal would be a nice touch. Maybe Amos Hoover would store them in the attic of the Hostorical Library. My interest in the Amish didn’t start until 2010, so I, too, was too late to have seen these in the museum. I have to agree that these figures in the pictures do feel a bit creepy…, but I have to also remind myself that they are totally removed from the context of the large scene they were made to be a part of. I dare think that if many of our own individual expressions or gestures were frozen in time and removed from their context that they would look creepy, too. But even so, I’m not inclined to want one of these sitting/standing on my front porch — except maybe for Halloween. Good point. As we can see in the photos some of them seem to be in strange poses, in context they would look more natural I assume. But the main issue for me is just the strangeness that results when trying to replicate the human form in media like this (for example with CGI or this type of thing). It’s the “uncanny valley” effect that’s offputting. That’s why Plain People don’t believe in “graven images”. They are too creepy. They should be melted down and turned into wax candles. Why are they looking up? Why are they all posed to be looking up? What are they supposed to be looking at? Good question, my guess based on the article’s mention of the barn-raising scene, would be that the ones looking up would have been observing or assessing work on the barn. Maybe they could be used in stores (or homes) as crime deterrents. Can you imagine running into one of these figures when breaking into a home or business for the purpose of robbery? Otherwise, I agree with Don Burke regarding their Halloween use! They make my skin crawl! Yes creepy is my take on these dolls. I wondered why they were looking up at first but then I read that they were in a barn raising scene and it made sense. they were watching workers on the beams. LOL I think what makes them creepy is the eyes. Shivers! They don’t like any Amish people I know! So something like Amish scarecrows, I could see that too. Some of the wax figurines actually are somewhat decent, but what I think makes them look so creepy are the eyes. None of the eyes have a realistic look to them. The whites of the eyes are so white it gives that evil look. Thinking that these were done in late 60’s early 70’s I suppose whoever made them did the best they could. I would like to see better pics. of the little girl and the dog, and the little girl’s dress is too long for her-doesn’t show her hands. Her sleeve length needs to be taken in. I am a doll collector and somewhat interested in the little girl figure, and the dog which isn’t seen. I think there were only about 4 photos included with the article I linked, so I don’t know that there’s a better shot of the girl unless there are others on a different site. I just did a brief check in Google but didn’t see anything else. I have an antique child’s rocking chair and can imagine the little girl sitting in it. Maybe with the dog nearby. I agree some of the figures are very lifelike while the others the artist did a poor job. 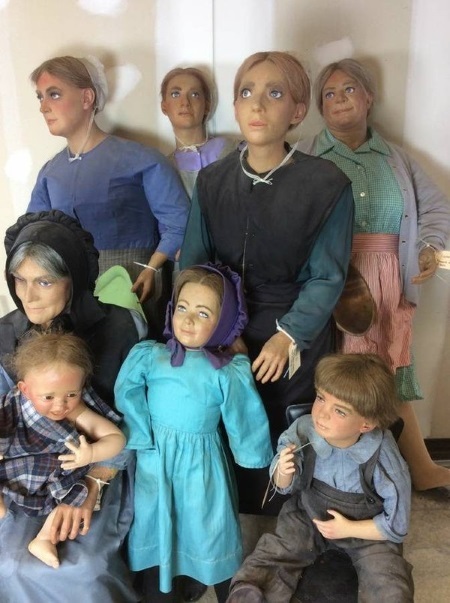 It’s interesting that the owner finds them creepy but she don’t feel creepy asking $350. each while exploiting such wonderful Amish folks. Only shows that money and greed are evil. No, those are definitely creepy! Those really are creepy! Can you imagine finding one of them in a closet? I know! The idea of one of those things in the house in the dark is bad enough, but moving and speaking? I’d die. I grew up going to the Wax Museum and it was awesome; historically accurate and fact filled. While it was a little touristy – it also consisted of many scenes depicting the history of Lancaster County. For example – the Ephrata Cloister being used as a hospital after the Battle of Brandywine, the Paxtang boys massacre of the Conestogas and that the Kentucky Long Rifle actually came from Lancaster County…. and there’s many more. 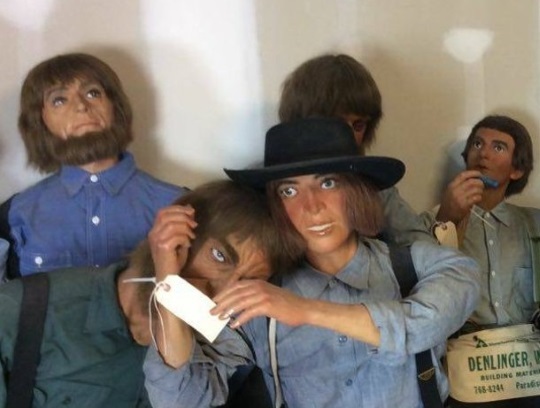 The figures in question were from the last scene – the Barn Raising scene – which is the only place the museum featured Amish. It was a modern ending, if you will, to the history of Lancaster County. 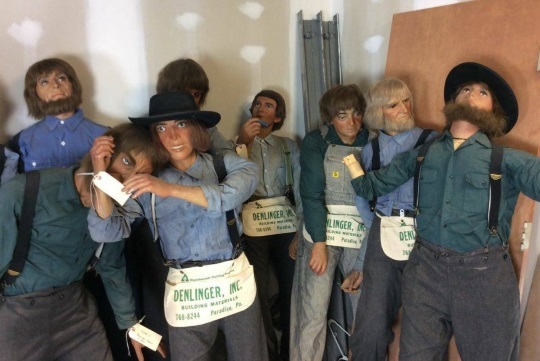 The aprons that the men are wearing – from Denlinger Lumber – simply show that at the time the wax museum was built, Denlingers would have been Eastern Lancaster county’s (Amish country) only lumberyard. To me, those aprons add reality to the scene because barn builders would have gotten their supplies at Denlingers. I enjoy the articles from this website for their informative value – but thought this one was way below usual standards. Is there no respect left for the Amish? The Plain People have continually been exploited, and this, quite frankly, is too much. They do not believe in pictures of people’s faces or of such sculptures. So along comes someone with the very thing which the Amish could never condone, or even in good conscience view. Disturbing? Yes, on too many levels. Melt them down, donate the wax, and an enterprising Amosh family could possibly make candles and sell them. The very idea that someone would use these to benefit their non-Amish family buisness is unconscionable and disrespectful. Find another way! I remember the wax museum very well, it use to be next to Dutch Wonderland in Lancaster. We would visit it in the late 70’s and 80’s while on vacation growing up. The figures were always displayed in a historical manner to represent the community. They had a presidents display, and early settlers one….the museum told a story of our nations history. They look like escapee zombies from an episode of The Walking Dead.Very creepy.